Oh, that's right. Real life happened (real life has a habit of meddling with childhood dreams like that). It turns out that there are very few companies that are looking to hire a full-time ninja, and rent is due on the first of every month. So, that's when you get a full-time job that doesn't involve ninjutsu skills. You end up filling your closet with button-up shirts to fit in at the office. Deep down though, that dream of being a ninja master still lives inside of you. We think it's about time that you realized your nearly lost dream. 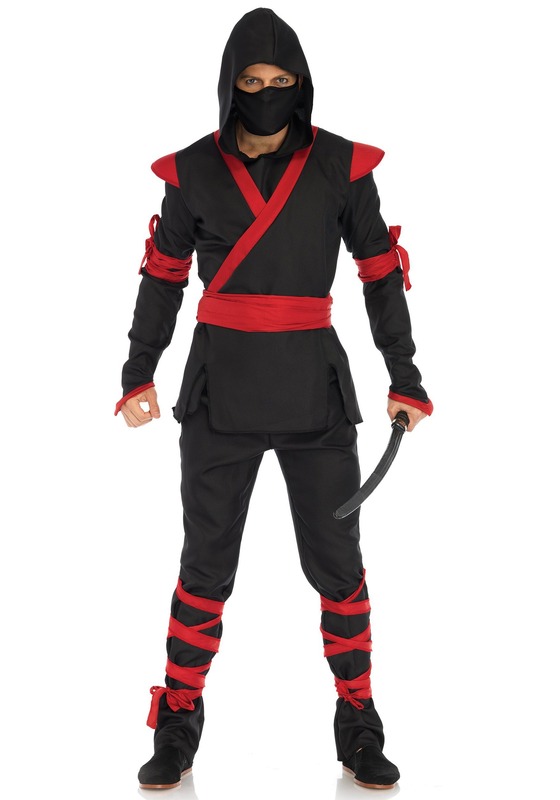 This adult ninja costume is exactly what you need to rekindle that passion inside! This adult ninja costume is exactly what your inner child dreams about! The costume is based on the classic shinobi style outfits seen in comic books, video games, and movies. It comes with a jet black top and matching pair of pants. It comes with plenty of daring red accents to help invigorate your shinobi spirit! Matching red arm and leg wraps help pull the look together, and the included ninja mask will help you hide your identity while you perform dangerous ninja missions. Your shinobi spirit will burn bright once again when you wear this ninja costume! But if you truly wish to bring your ninja skills to the next limit, you may want to check out our many weapon kits to add to your look.